The twin turbo RX7 in the wind-tunnel and wool-tuft tested on the road. So far in this series we've stuck tufts of brightly coloured wool all over cars and driven them down the road, analysing and photographing the swirling patterns of air and deducting where there's attached and turbulent flow, lift and downforce. Then last week we stepped into the DaimlerChrysler wind tunnel and looked at the smoke-stream testing of lots of late model Mercedes models. And this week? Here we'll go back wool-tufting on the road with a twin turbo Mazda RX7 (thanks for the car, Angus) - but we'll also look at some of the test data gained from this model in the wind tunnel. Despite their widespread use (effectively universal in the case of new cars), wind tunnels tend to keep their secrets. Sure, some data is released, but manufacturers are notoriously wary of releasing any information that might cast a negative light on their models. The Audi TT, for example, wasn't heading for the new car showrooms at the same time as tech journals were full of rear lift co-efficient data for the car... And when successive models go backwards in their aero behaviour, you'll never hear anything of that! So finding good wind tunnel pictures of a model showing both smoke-streaming and wool-tufting is difficult; finding detailed numerical data on drag (eg with a cross-wind component as well as the more common zero yaw angle), front and rear lift coefficients - and so on - is nearly impossible. The MIRA research facility (based in the UK) has excellent aero data collected on a variety of models in their own wind tunnel- but unfortunately you need to pay big bucks to get the info. So while at first glance it might seem easy to collect aero info to compare with our on-road wool-tufting, unfortunately it isn't. 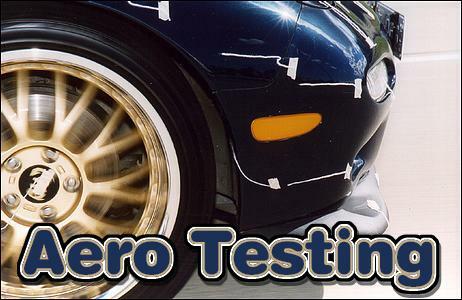 (And if you know of detailed aero data on any cars, please let me know!) However, with the shown twin turbo Mazda RX7, there is some information available. Gained from the very good book Race Car Aerodynamics - Designing For Speed by Joseph Katz (ISBN 0-8376-0142-8), it includes drag and front and rear lift figures. Additionally, there is a wool-tuft photo taken in a wind tunnel. So in a moment we can make some comparisons between what we saw with our zero-cost wool-tufting and the results gained in a mega-dollar tunnel. But first - the RX7 on the road. This broader view shows some of the same areas - but it also shows a major patch of turbulence behind the front wheel arch, especially over the vent. The turbulence surrounding the vent extends over a relatively large area. However, note the excellent flow patterns around the rear vision mirror - unlike most other cars, the Mazda has well-controlled airflow in this region. And the back of the car? In this photo it can be seen that there is completely attached flow from the roof down onto the rear glass, with superb flow wrapping around the pillar. Other photos show that this attached flow extends across the upper surface of the hatch as far as its trailing edge. If the (aftermarket) wing were to be removed, the wake would consist only of the area below the trailing edge of the hatch, to the full width of the car. Surprisingly, there is some flow separation on the lower part of the rear bumper at the side of the car - perhaps the much larger than standard aftermarket wheels are contributing to this turbulence. So take away that rear wing and you're talking a car with a very small wake, and attached flow over nearly every surface of the body. However, that wrapping of flow from the roof all the way down over the rear hatch is sure to generate some lift and drag... isn't it? This Dave Heinrich view summarises the flow patterns that we found on this particular car - elevated aftermarket rear spoiler and all. This pic of the RX7 in Mazda's wind tunnel is very exciting - not because it's a B&W and slightly grainy photo, but because of what it shows. Look very carefully at the wool-tufts and you'll see that their behaviour duplicates almost exactly what we found on the road in our testing. Specifically, note the attached flow over the bonnet and windscreen, the clearly demarcated area of turbulence over and around the vent behind the front wheel, and (as much as can be seen from this angle) the attached flow wrapping onto the rear glass from both the roof and side of the car. See, on-road wool-tuft testing is very accurate! So, what of the figures? The RX7 was originally sold in two guises - a baseline car without front and rear spoilers, and the R-2 package that included a rear spoiler and front air dam extension piece. The data makes for very interesting reading. Let's look at the drag figures first. As suspected from our wool-tuft testing, the RX-7's drag co-efficient is very low. In its rare shown spoiler-less form, Cd is just 0.29 (and with a frontal area of only 1.79 square metres, the total drag is also very low). However, the addition of the spoilers increases drag to a measured 0.31 - that's 7 per cent more drag. Before we look at the affects on lift of those spoilers, why did their fitment increase drag? Well, that rear spoiler (perhaps it's meant to be a wing but it sure spoils the airflow!) stands high enough above the rear deck that the wake is increased in size. That's my guess, but it seems a reasonable one. Its presence may also affect the attached airflow in front of the spoiler, on the rear window. The front air-dam extension is unlikely to have much affect on drag; if anything it is likely to lower it a little. However, it is not immediately apparent why - at 0.08 - the rear lift of the RX7 is in fact so low. You'd certainly expect that superbly attached flow over the rear roof and down the rear window to cause all types of lift problems - perhaps the under-car airflow is being made use of. Of course on-road wool-tuft testing doesn't tell you everything. On the basis of our woolly testing, we'd have assumed that the RX7's shape develops a fair amount of rear lift - something which the 'official' wind tunnel tests show not to be the case. However, our ascertaining of where there is attached and turbulent flow, and the actual directions that air is moving over the car, are spot-on.